Gum disease, or periodontal disease is the most common disease people have. Nearly everyone from sub teens to older adults has it. 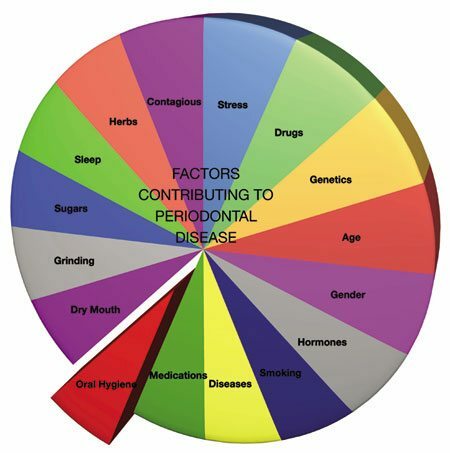 If you look at the pie chart of things that contribute to gum disease you can see why it is so common. The germs in the plaque on your teeth trigger the body’s inflammatory response. The damage caused in gum disease depends on how your body reacts to the germs. Just like some people can catch a cold after being exposed to one sneeze or being out in a draft and others rarely catch cold, resistance to gum disease can vary considerably. Almost anything that can lower your body’s resistance can contribute to causing gum disease. As you look at the chart of causes, the slices appear equal but the effect in any one of us is not equal. For some it is too much stress, less than the best nutrition, other conditions like diabetes, pregnancy or nursing, less than optimal rest, hormonal imbalances, medicines and drugs we take such as blood pressure medicines, sedatives, sleep enhancing drugs and mood altering drugs, (caffeine, nicotine, aspirin and herbal remedies count too. Most people have several contributory factors. The answer is to do your best to manage these things, practice the best home care you can to keep the germs off your teeth and if you have any symptoms of gum disease like bleeding, red of swollen gums or bad breath, go for professional cleanings every 3-4 months.